This vegan brownie recipe is the only no-fail recipe you’ll ever need! 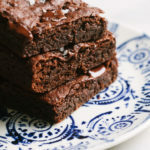 Perfect gooey brownies, incredibly fudgy, super easy to make and downright indulgent! Preheat oven to 350 degrees F. Line and 8 x 8 baking dish with parchment paper, or lightly grease with oil. Flax egg: In a small bowl, combine 3 heaped tablespoons flaxseed meal with 1/2 cup water or unsweetened non-dairy milk. Let rest for 10 minutes to thicken. Mix: In a medium size mixing bowl, add the 1/2 cup butter/oil/applesauce and sugar, mix well. Add in the flax eggs and vanilla, mix again. Add in the flour, cocoa powder, baking powder and salt, mix well to combine. May take a minute or so to completely become mixed. Pour: Pour brownie batter into the center of the prepared baking dish. Spread to the edges as needed. Optionally top with chopped chunks of dark chocolate or vegan chocolate chips. Bake: Place in the center of the oven and bake for 25 – 30 minutes. Cool: Let cool in the baking dish. If you used parchment paper, after 5 – 10 minutes, lift the edges and move the brownies to a wire rack to cool. Store: Keep loosely covered on the counter for up to 4 – 5 days. They keep longer in the refrigerator, up to 2 weeks. My favorite butter is Miyoko’s Butter, it is a little more expensive, but it’s quality. I’ve also made these with light flavored olive oil (as shown here) and applesauce with great success! I find that organic pure cane sugar is much sweeter than coconut sugar. If you’re looking for sweeter brownies, definitely stick with pure cane sugar. If using applesauce, these are low-fat brownies.